Someone recently reminded me how helpful interaction is when it comes to our corporate worship gatherings. We’re all wired differently. Some of us want to meet someone new right away and share where we’re struggling in life. Others of us would never dream of sharing personal stories with strangers in a large group. That happens in a small group of people we trust! This past Sunday, we tried something new at our 9:00 service. We set up an account with Poll Everywhere. I created two polls and downloaded an app that allowed me to place the poll inside a PowerPoint slide. Then when my techs pulled up the slide, it ran itself as people texted in their answer. The first poll acted as an ice breaker and to help people get familiar with the technology. We asked if the Seahawks would win their game that afternoon. (Yes, of course. But barely. That was an awkward last play). I invited everyone to pull out their phones if they had them with them. They texted a code to a given number and received two text messages back immediately. They received a disclaimer that they might be charged for the messages. (It’s my understanding most people would not be charged for texting according to their plans). They also received a text saying they were now part of the poll. Next, they could text the letter A, B, or C and hit send. Their response appeared on the screen within two seconds. We were pretty impressed how quickly it went live. We enjoyed watching the percentages shift as responses arrived. I went on with my message for the morning and about 2/3 of the way through, I invited people to pull their phone out again. 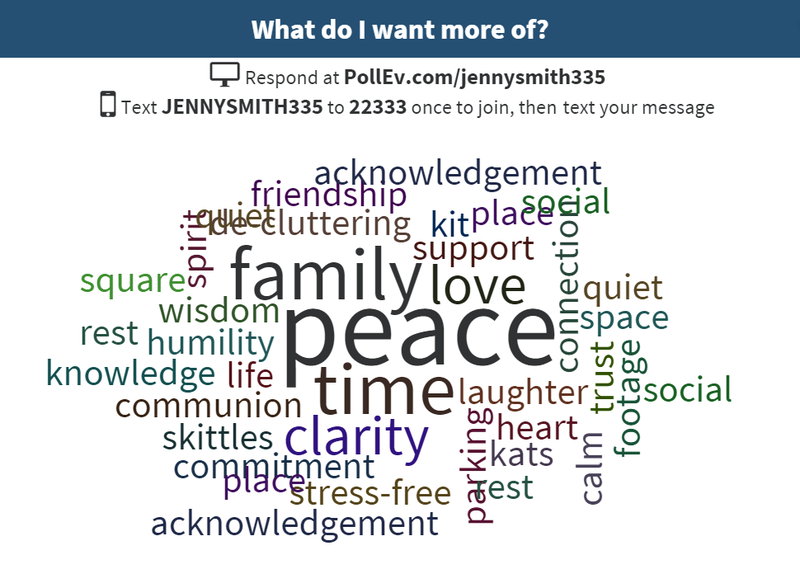 This time, they were already part of the live poll so we asked the question, “What do you want more of?” We were reflecting on greed in our lives. My favorite moment the entire morning of worship was the quiet space created while people sent in their word. It felt like holy ground as I learned more about my people in those few minutes than I could have in a week of conversations. We want more communion, wisdom, square footage, trust, laughter, connection, friendship, rest, humility and Skittles! So here’s to new experiments. 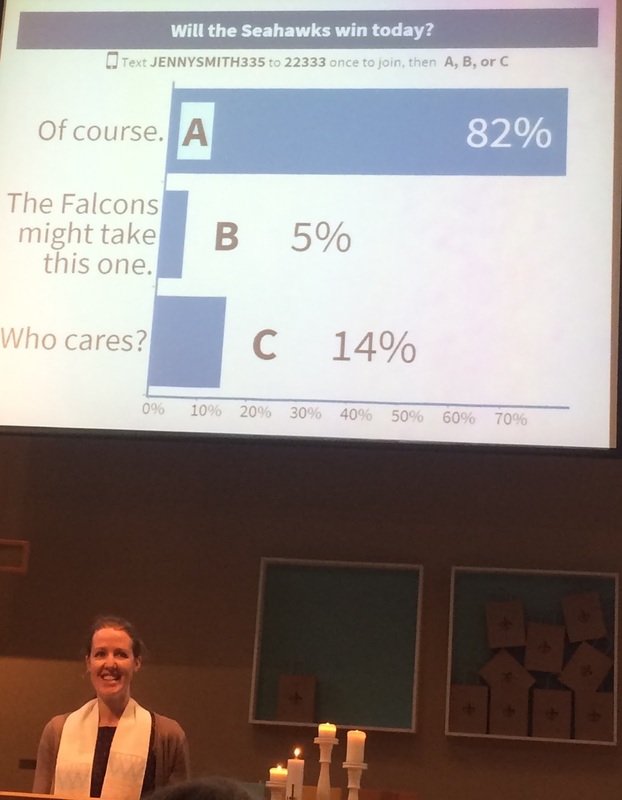 If your church has used live polling or you try it in the future, let me know how it goes! I have seen this in use in youth and tween ministry gatherings before, but I haven't used it in worship because I assumed it required a smart phone (something many of my people do not own). Good to know that people can simply text in their answers. I think I may need to try this tool in my next sermon series. Thanks for the great explanation. Hi Lindsay! Yes, it worked well for any kind of phone. Good luck! Let me know how it goes.